I haven't really fully recovered from the jam-packed Ilocos trip we just had one week ago, and yet, here I am again, aboard a bus bound for Ilocos Norte. 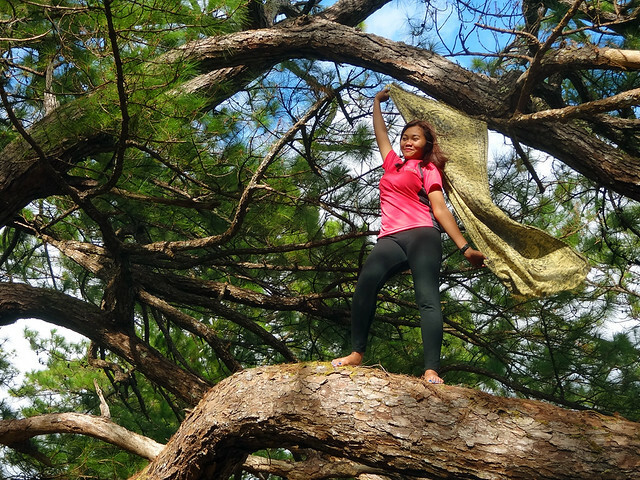 (Kung may spare time kayo, please do check out my blog about our Ilocos trip in this link). 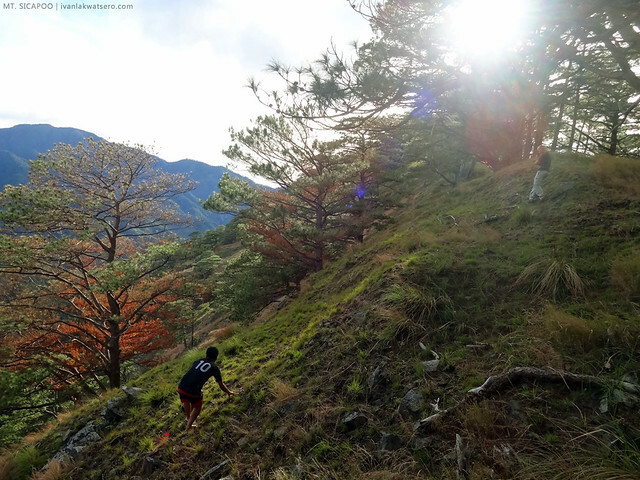 But I won't be visiting any touristy beach nor an aged heritage building, for in this episode of my life, I will be on a mission to reach the highest peak in Ilocos Region. It was still very dark, and everyone seemed still sleeping when we arrived in Laoag City. Masyado pang tahimik. We were to meet with our hired jeepney somewhere there but we can't get through his phone. Tulog pa ata si kuya. So for the meantime, we had breakfast and bought our packed lunch as well in a well-known fast food chain, bilang siya lang naman ang bukas sa mga oras na iyon. By 6 o'clock, our jeepney service finally arrived. We're all set and excited. Solsona here we come. Welcome to Solsona. Who would've thought that this humble town in the outskirts of Ilocos Norte is the gateway to Mt. 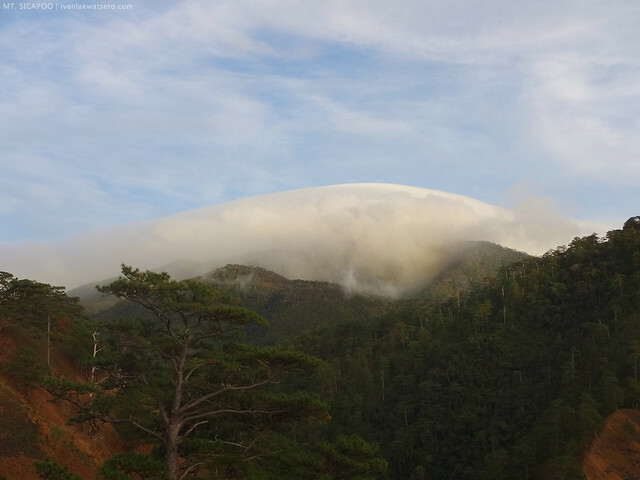 Sicapoo, the highest in the whole of Ilocos Region. 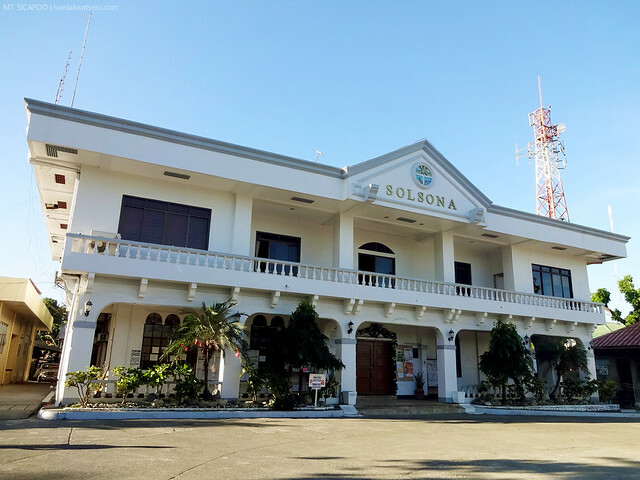 Solsona is just a small quaint town situated at the eastern border of Ilocos Norte, about 1 hour from Laoag City, and already next to the mountainous Cordillera Region, specifically Apayao Province. No one's really visiting the place until One Degree Mountaineers introduced it as the gateway to Mt. 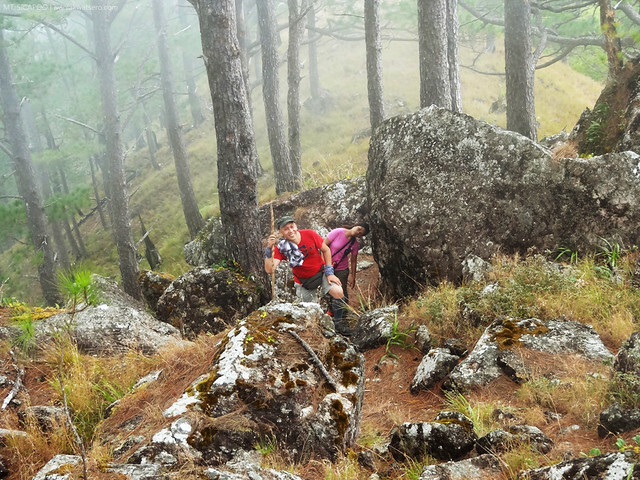 Sicapoo, perhaps the province's premiere hiking destination. As part of the SOP, we dropped by the municipal police headquarters to register before heading to the main jump-off point. ang labing-isang indibidwal na sabik na sabik makakita ng penguin. Upon coming to Brgy. Manalpac, our group was welcomed by Tatay Emil himself. He invited us to his humble home (the main jump-off point), and even helped us deal with the final preparations. 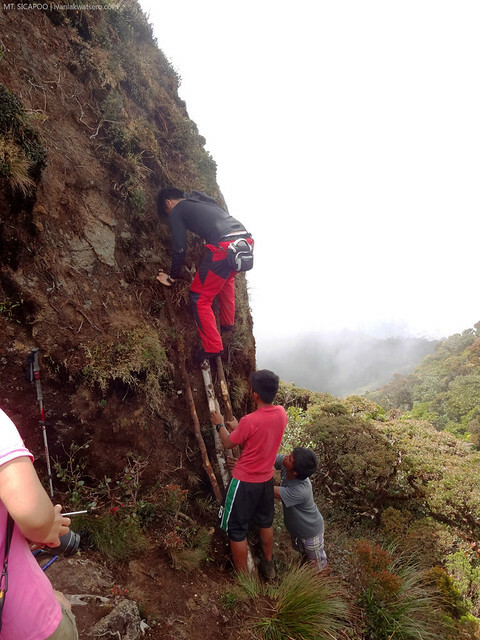 By the way, this Tatay Emil is among the group that originally trail blazed Mt. Sicapoo. He may seem old but I tell you he's capable and still kicking. and what not to pack. 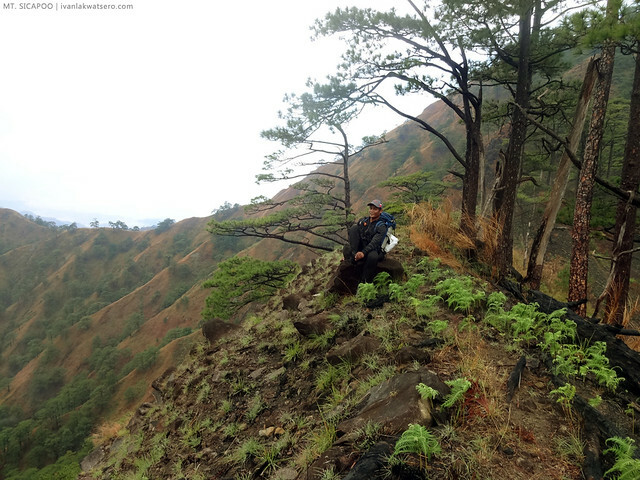 Surprisingly, before the hike began, Tatay Emil declared that he would be joining us in our adventure. How cool is that!? 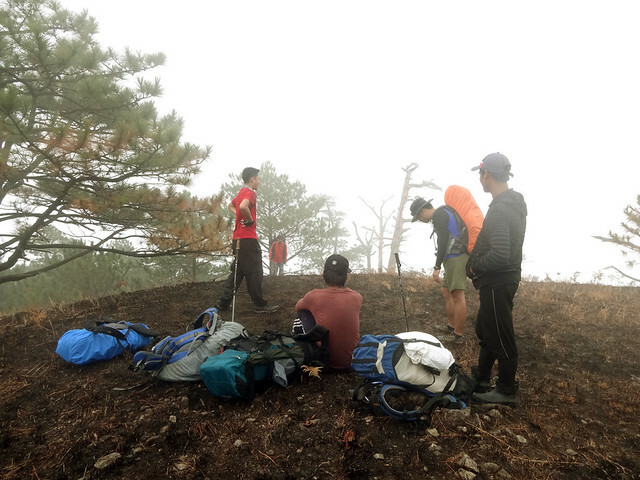 So in this hike, there would the 11 of us, plus 4 strong guys including Tatay Emil. the faces I would be seeing in the next 3 days. 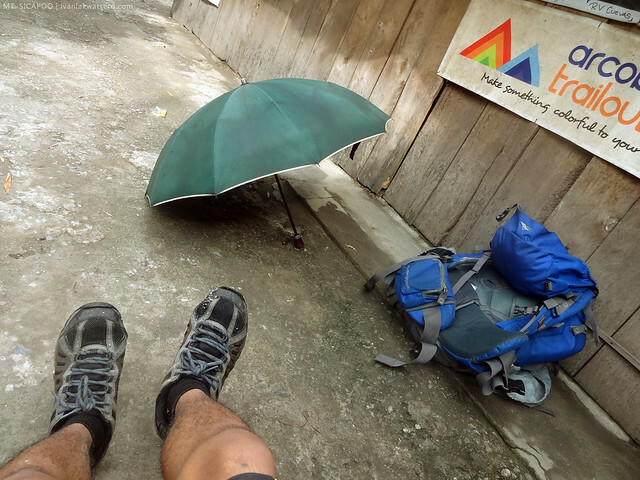 My life as a passionate hiker has started to slow down as the year 2014 drew near. From almost 3 to 4 mountain adventures every month within the first half of 2013, it slowed down to at least 1 hike per month later that year. 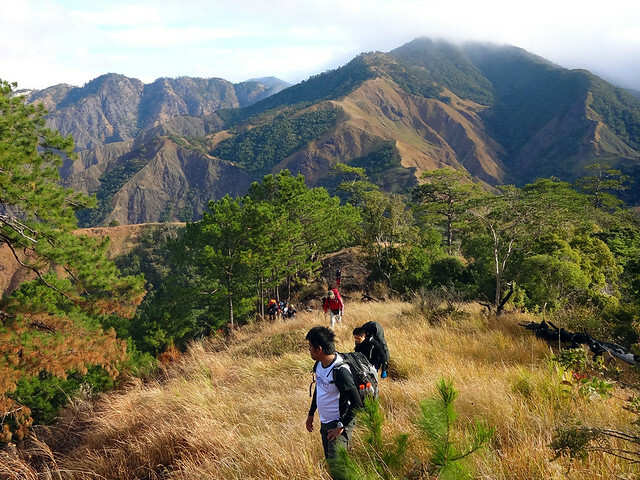 And as a result, I was already gasping for air during the first few minutes of our trek here in Sicapoo, at nasa patag pa lang kami sa mga panahon na yun. For sure, things won't go easy for me in this hike. Apart from that, the sun that's shining brightly above us spells nothing but a hellish march to the campsite. 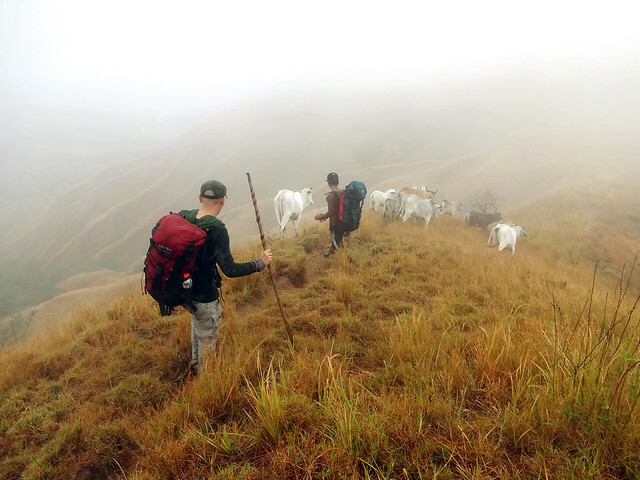 By the way, we followed a 4-day itinerary in this hike. 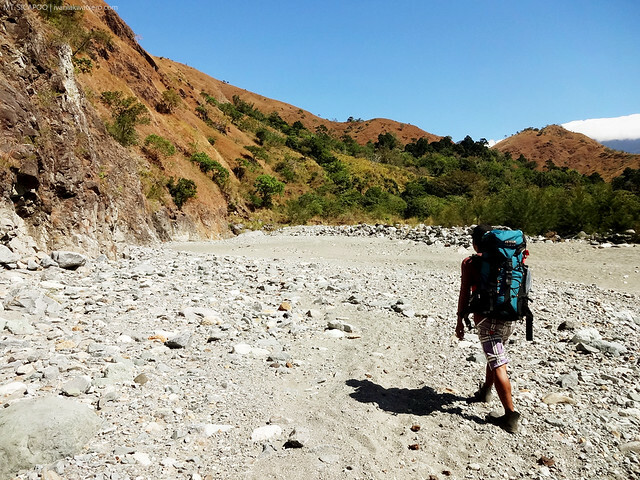 The original plan was to go for just 3 days, but Tatay Emil's words were so convincing that we all yielded to following the old-school 4-day itinerary. Pero walang pagsisisi, that extra day we spent in the mountain was just so worth it. Now going back to our hike. 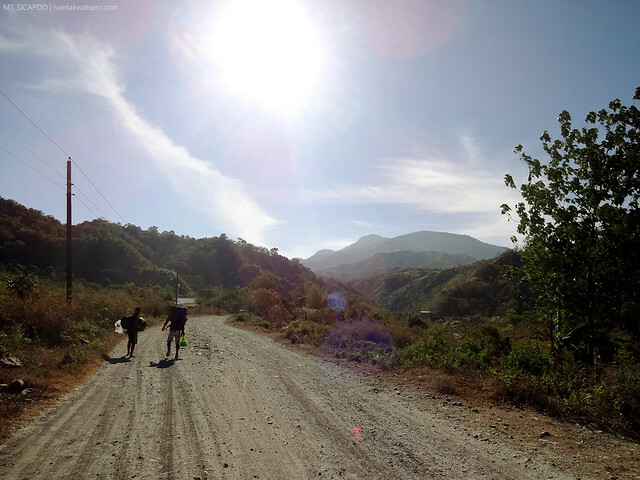 Thirty minutes into trekking and we're still walking along a dirt path under the sun's mercy. Patches of woodland were encountered along the way but still not enough to give us the shade we needed the most. Later on, as we crossed a bamboo bridge, we started to hear the sound of a gushing river. Ah, must be the famous Gasgas River. It was around 10 o'clock in the morning (1 hour since we left Tatay Emil's house) when we had our first sight of Gasgas river. Gasgas River, it somehow resembles Akiki's Eddet River. Judging from afar, I can say that Gasgas river is a healthy river. Sobrang linis at super clear yung tubig. It felt so refreshing the moment my feet touched the water. 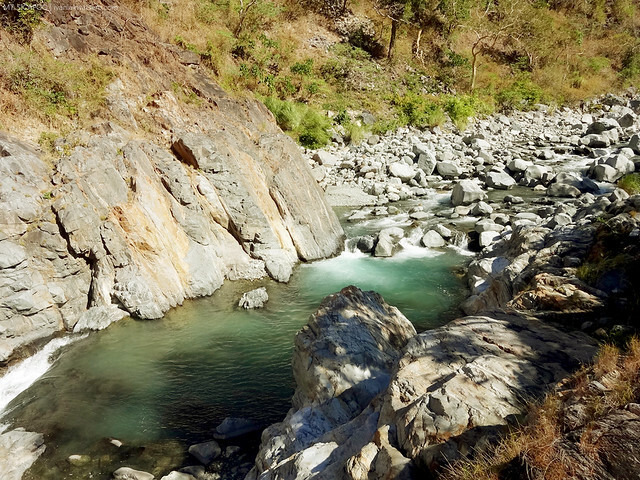 Not to mention, the parade of gorgeous rock formations carved by nature itself is found along the river. Gasgas River. 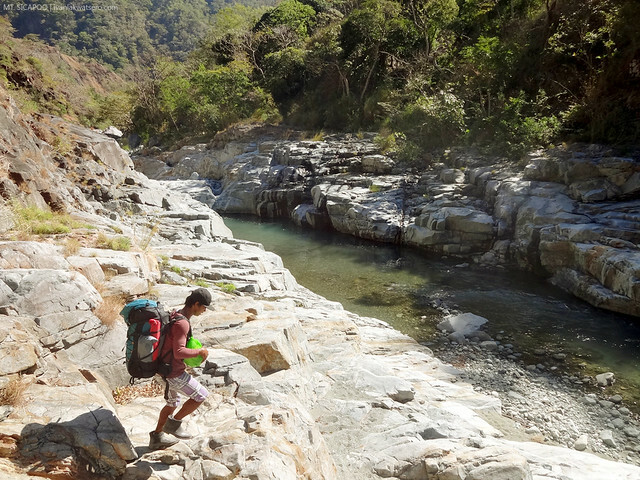 Half of our day would be spent trekking along this river. 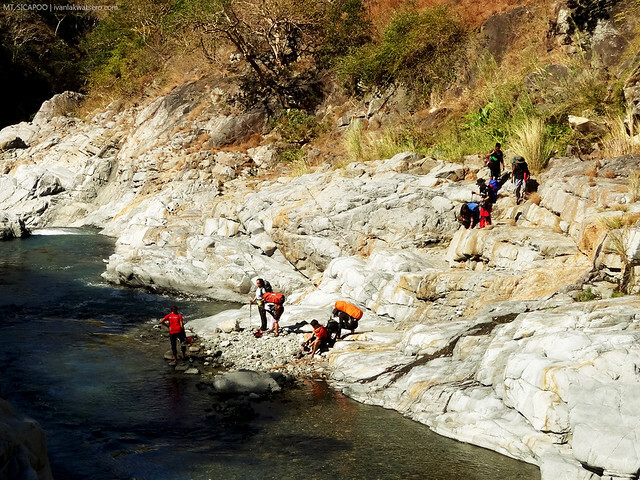 The rocky and slippery terrain of the river proved no easy task for us. There were times, we would hop from one rock to another, and sometimes we would have go through a knee-deep gushing Gasgas river. And that's not all, Haring Araw is also there to give us tan skin. It felt like Balingkilat sa sobrang init. Mapapakanta ka talaga ng "Shet, sobrang init, abot singit!" But to be honest, I'm truly grateful that the Creator blessed us with such fine weather. 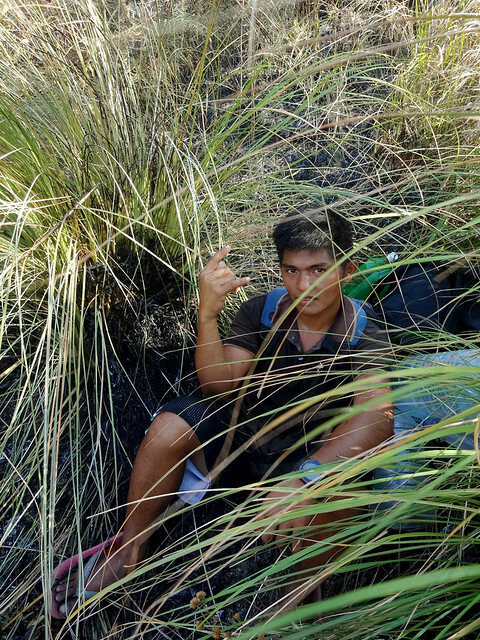 Sabi ko nga sa sarili ko while we're trekking, "ok na rin 'to kesa naman rumaragasa yung ilog dahil sa ulan." You know I've seen pictures online where the water in this river rose to neck-level during the season of rain. Some parts were even impassable. There were no steep ascents (just yet) the entire time we're at Gasgas River. Or if there is, it was too gradual that we hardly noticed we already gained elevation. By lunchtime, we stopped by a shaded part along the river where a fresh water source can also be found. It's the perfect place to have lunch. chow time. Since there's still a long way ahead of us, we resumed trekking after an hour. Resuming our trek at round 1:30 PM, the sun was nothing but more excruciating. 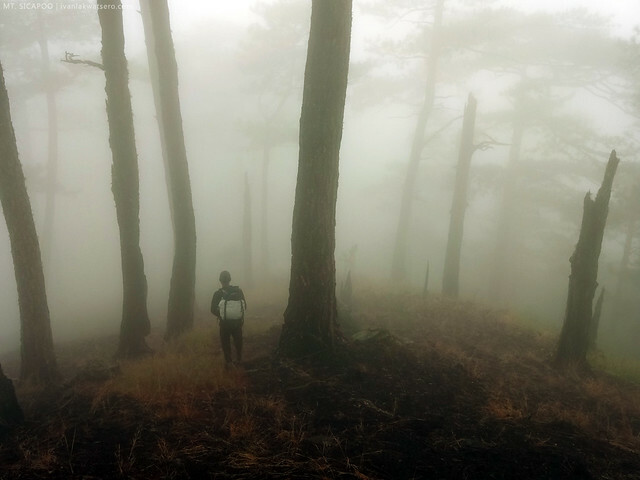 Hiking on an open area during the peak of the day is perhaps a crazy idea. Pero sa kabila ng lahat, tuloy pa rin ang pag-sabak. 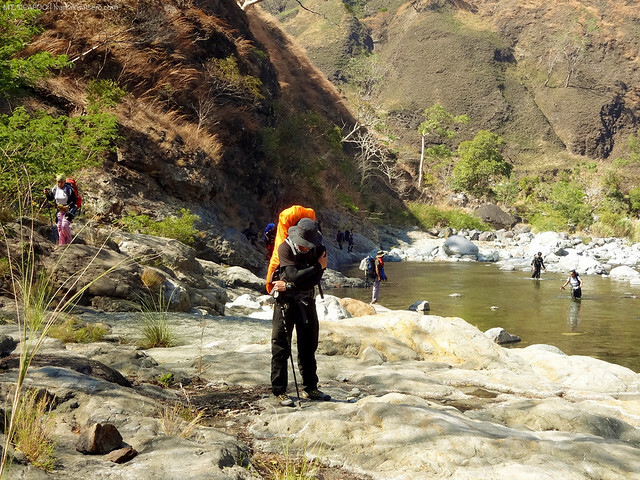 At one point in the entire river trekking, I admit, I felt scared. Nanginig nang sobra ang tuhod ko. 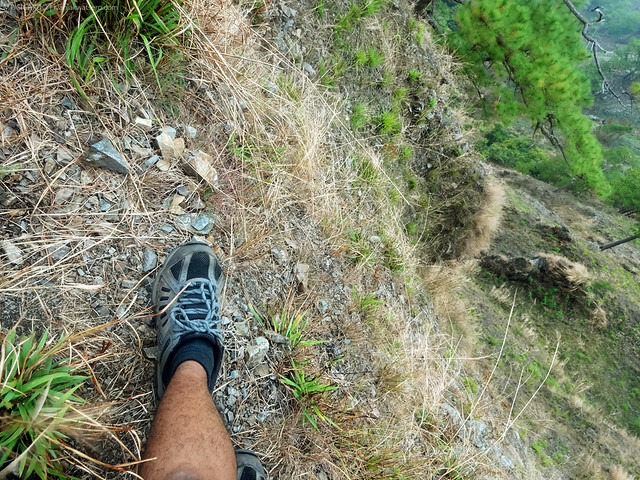 Pano ba naman kasi, the guide I was tailing led me to a very steep cliff side. 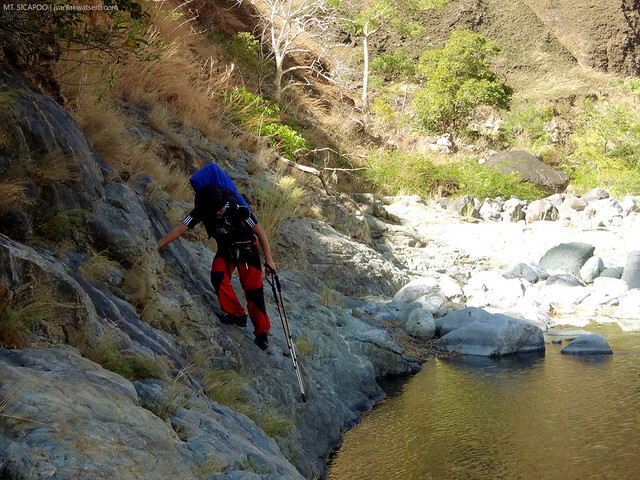 It's not a high cliff, just around 4 feet high, but if you fall, a deep Gasgas river is ready to catch you. As I watch the guide go over it, it looked very easy and manageable. Parang wala lang. But when it was my turn, deym, I felt my knees were shaking. The guide I was following was far ahead of me, and my comrades are still far at the back, and I was like a stunned helpless kid. 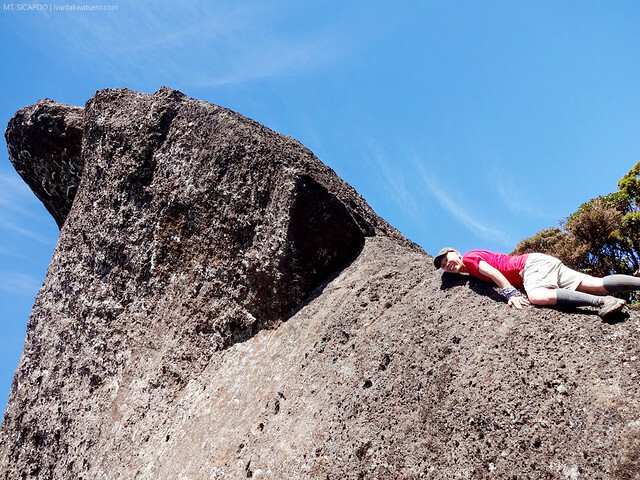 The cliff rocks were steep and slippery, my shoes can't get a grip and there were no rough edges to hold on to. Para akong nanigas at malapit ko nang gustuhing tumalon na lang, pero hindi naman ako marunong lumangoy kaya hindi ko rin magawang tumalon. Buti na lang, I managed to hop and cling like a boss and saved myself from disgrace. Para akong nasapian ni Edward Kenway nung time na yun. I was still catching my breath when sir RJ came and probably undergone the same dilemma I just went through. Everyone else had a hard time passing through that steep, but as you can see, we all made it. 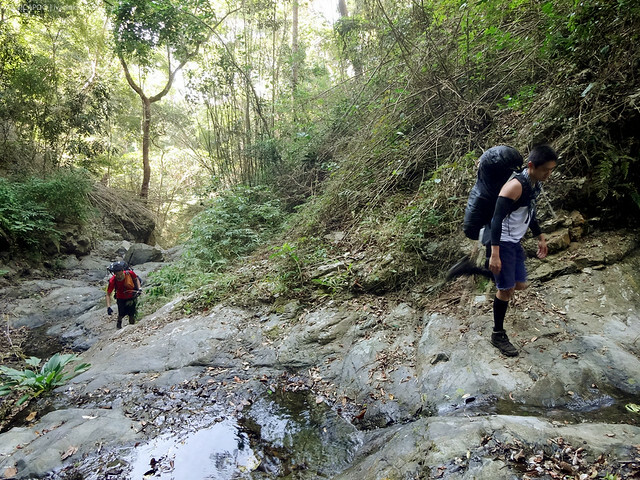 Thanks to Haring Araw, our trek along Gasgas River was a furnace, figuratively and literally. 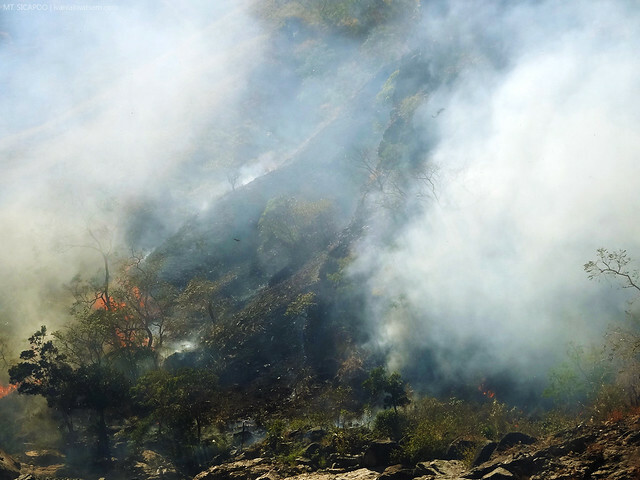 Due to the scorching hot weather, some portions of the mountain were set ablaze. Smoke was everywhere and the fire was spreading really fast. Entire mountain slopes were charred. And it was hot like hell. Shunning the burning grass and bushes, we quickly passed by the area. And from the burning mountain slopes, it did not take too long until we came to the final river crossing of the day. 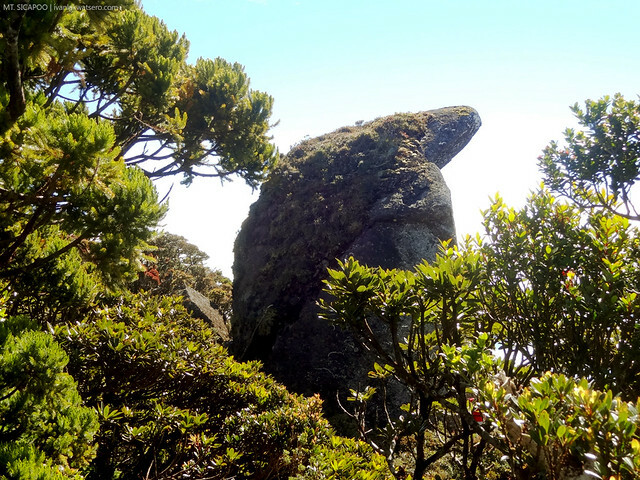 Across it, we met this huge chunk of rock called "markang bato". This rock does not serve as a marker to any buried Yamashita treasure nor a hidden passage to the underworld. It simply marks the end of our river adventure and start of a grueling assault to the campsites. 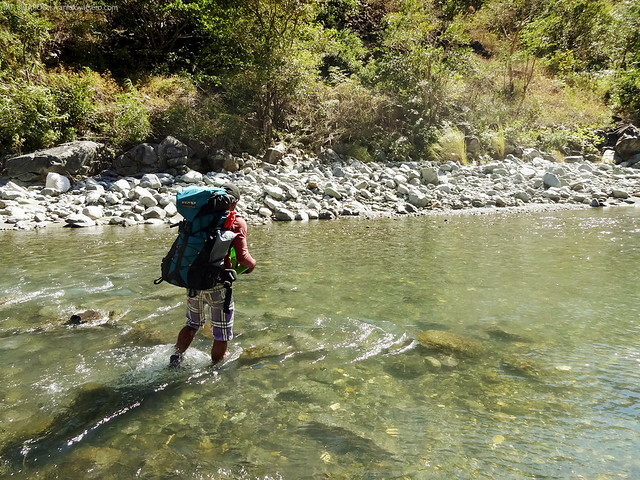 The final river crossing, right before we reached "Markang Bato" landmark. Here's our TL Jay. 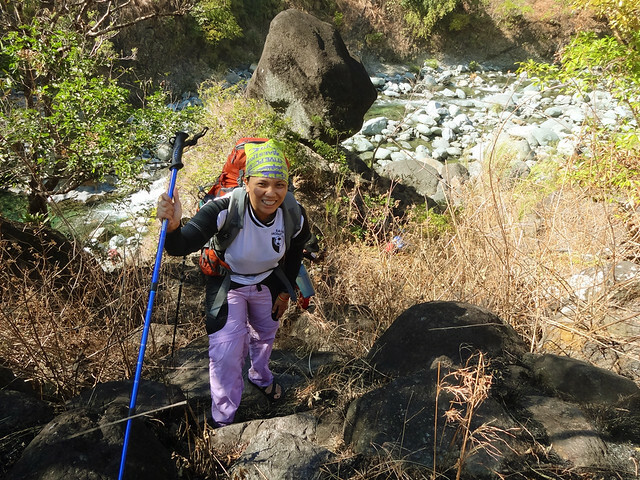 Behind her is the "markang bato", a landmark signifying the end of river crossings and start of the leg-tearing assault to Balbalitok Campsite. 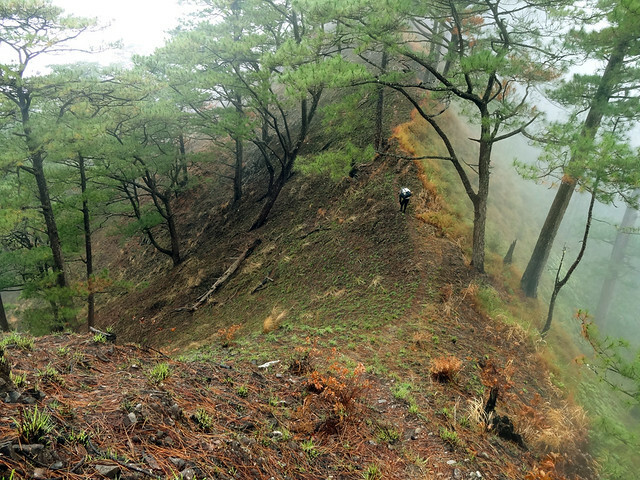 To be honest, that long continuous assault past markang bato was one of the toughest parts of the entire Sicapoo trail. 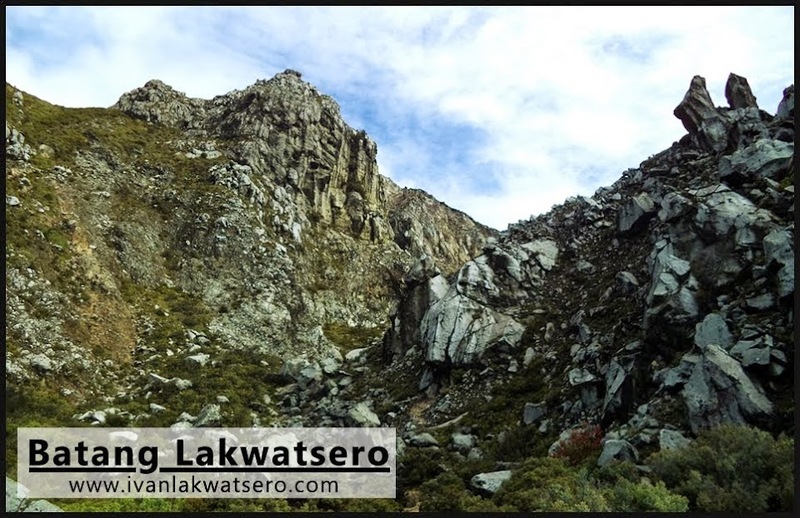 It's like Pulag's Akiki ten folds. 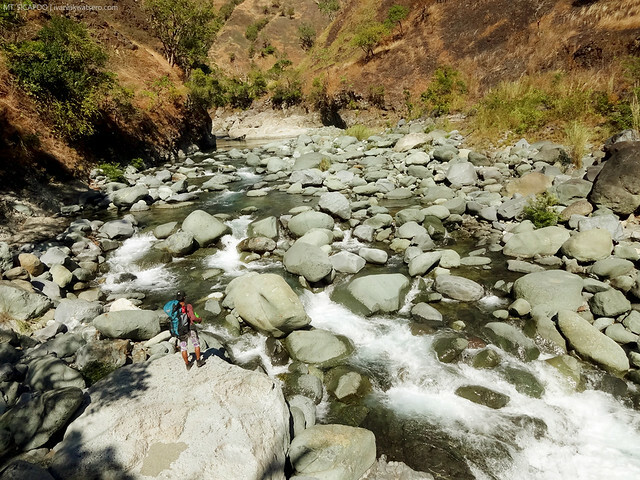 Sa simula kasi masasanay ka sa gradual ascent lang habang nasa Gasgas river, pero pagkalampas sa markang bato, biglang binawi lahat. steep kung steep. 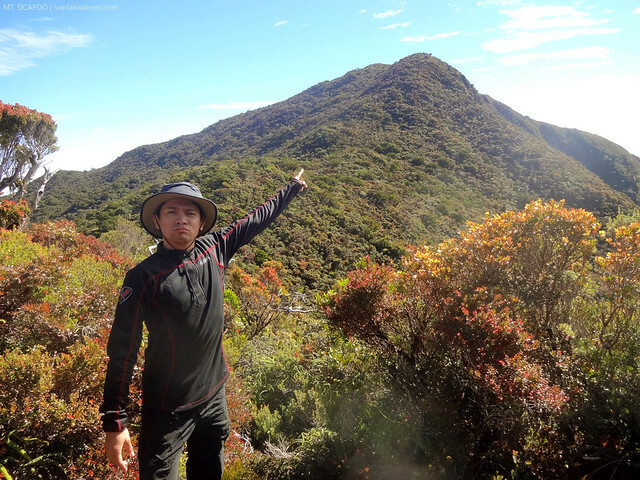 One of our guides, Kuya Alwin. The assault was challenging, pero rakenrol pa rin. From a grassy environment, the trail eventually changed to this rocky trail. 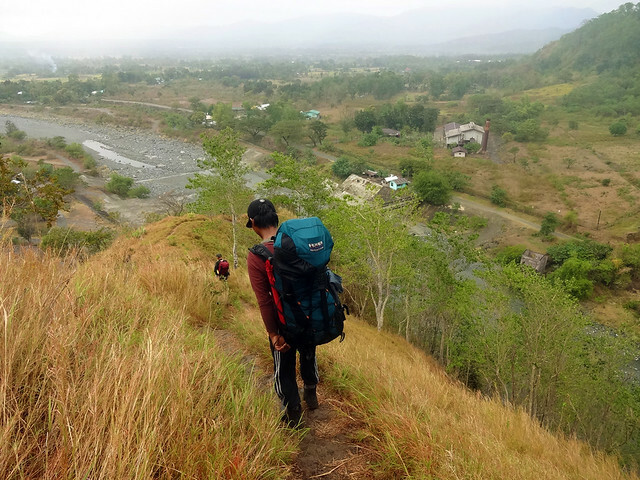 Despite all odds (pulikat, init, pagod, uhaw, name it all), the long arduous ascent has to continue. Alam ko sa sarili ko na pagod na ako, but I keep telling myself, "ako ang magluluto ng dinner, kelangan mauna sa taas." Minsan, ok din na ipang-motivate sa sarili ang mga responsibilidad na dapat gampanan. Thankfully, after some time, Kuya Alwin announced that we're almost done for the day. Malapit na raw ang campsite. What followed that announcement were splendid views of cascading ridges and refreshing touch of cool breeze. All of a sudden, napawi lahat ng pagod ko. The mere beauty of nature, and of course, the thought of we're almost finish for the day boosted our morale. One last stop bago ratratin hanggang sa campsite. 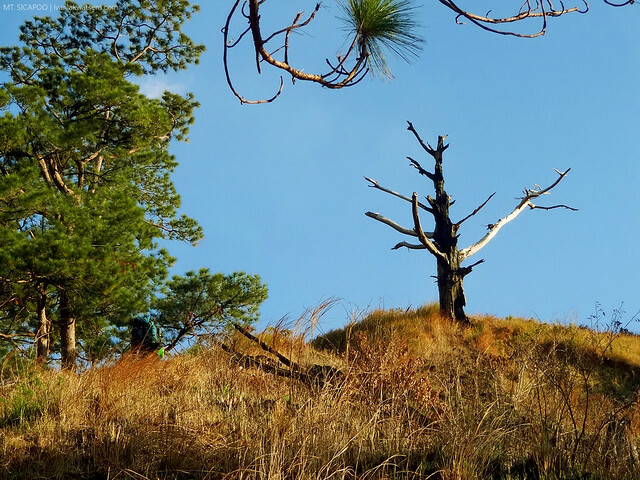 The seemingly non stop ascent finally ended when we reached the dead tree marker. From that point, Balbalitok Campsite, the day's end point, is just stone's throw away, quite literally. We'll be spending the night at Balbalitok campsite as insisted by Tatay Emil. So at around 4:30 in the afternoon, the day's agony came to an end when we arrived at that place. Maaga pa, marami pang oras mag-chillax. 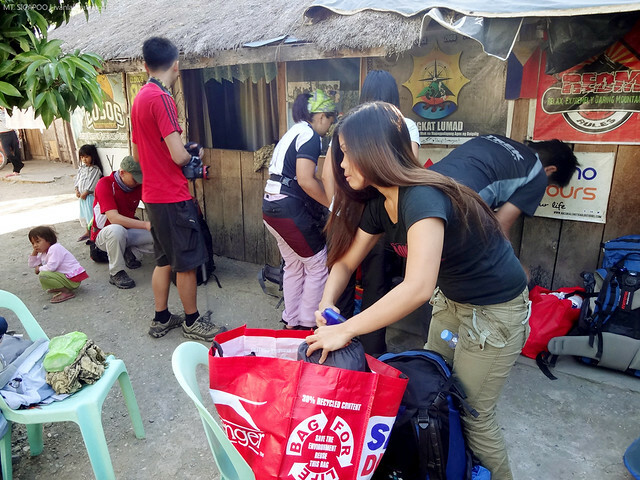 While waiting for the tail of the group to arrive, our guides gathered all our containers to fetch some water from a nearby water source. And since I'll be cooking pasta for dinner, I decided to join them. marami-rami kasi ang kakailanganing tubig para sa aking lulutuin. 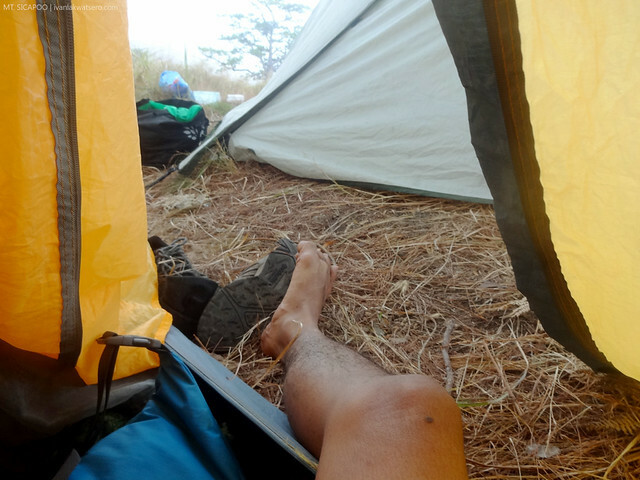 At Balbalitok Campsite. Setting up the camp is my most favorite part in every hike. Night time came fast, so as the dinner time. It took us an hour to prepare the meal, and by 7 PM, we're already munching my putanesca. We were all tired and hungry from all the day's activities that's why as soon as we finished dinner and a little chit chatting, everyone entered their respective tents to energize for what awaits for us tomorrow. End of day 1. The chilly mountain air woke us up the following morning. It was 6 AM and I felt my body's aching a bit. Buti na lang, we were served hot coffee, and tuyo with egg and hotdog to jumpstart the day. We rushed things that morning thinking that we might reach the next campsite late. As soon as we finished breakfast, we broke the camp then quickly packed up our things. And besides, it was very cloudy that morning, an opportune time to sneak away from the burning sun. By 7:30 AM, we're already threading our way to Saulay Junction, the next stop of the day. it was again an uphill trek. Having no idea on how long the trek will be towards our next stop, I prepared my mind that it's going to be another long journey. Talagang nag-set ako sa utak ko na baka 4:30 PM ulit kami makarating sa susunod na campsite. 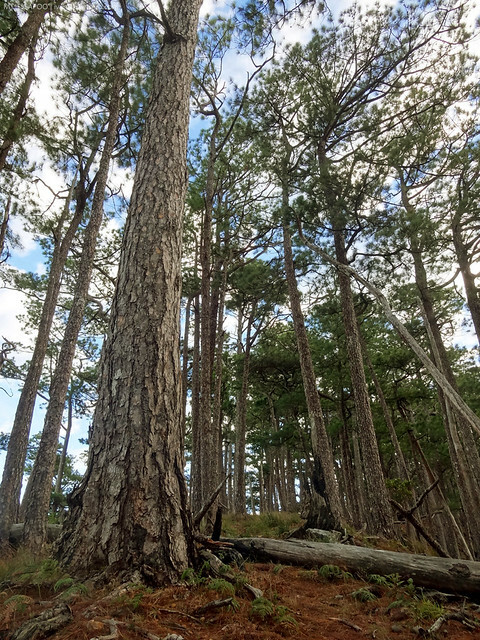 tall pine trees along the ridge trail we were trekking. I think I only lost half a kilo of load since yesterday, so I was probably carrying in my back a total of 10kg upon start of day 2's trek. 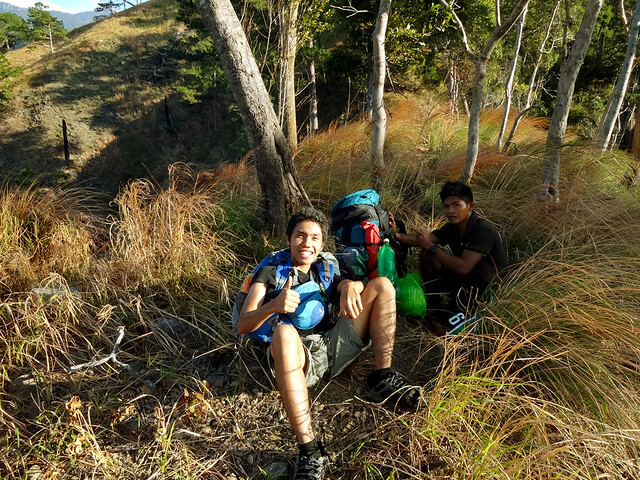 After 2 hours or so, our guides halted and dropped their bags on the ground and said, "nandito na tayo sir." 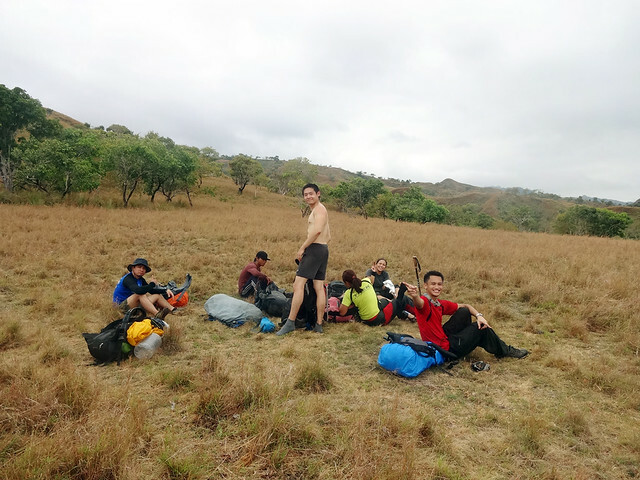 I thought we're just gonna rendezvous there and wait for the last man to arrive before resuming our hike, but he actually meant, we're done trekking for the day. Akala ko talaga nagbibiro lang sila, but when Tatay Emil came and uttered, "set up na tayo ng camp," napagtanto kong seryoso pala talaga sila. It was only 9:00 in the morning, at hindi pa nga nababanat yung mga hita namin. At first, I was really confused on why we set up our camp at Balbalitok campsite yesterday when Saulay campsite is just 2 hours away. It seemed really pointless to me. But as time passed by, tinanggap ko na lang ang katotohanan na talagang 2 hours (or less) lang ang trek namin for the day. This is the very reason why it is really possible to cut down the 4-day itinerary to just 3 days. 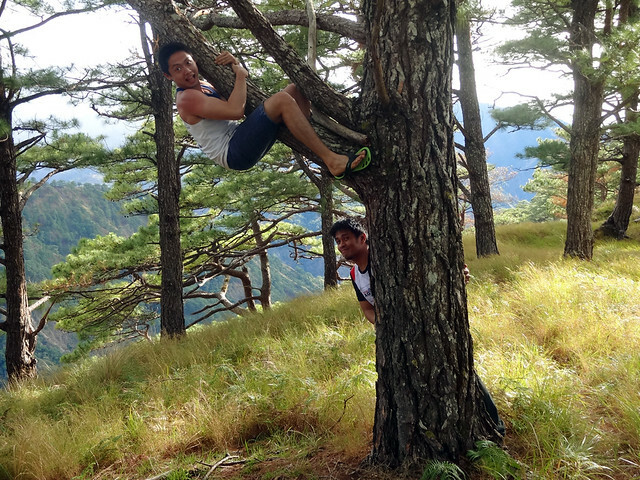 So now, as we finished day 2's hike, we were left with nothing to do. As in biglang wala kaming walang maisip gawin. It was still too early to prepare lunch, and much much early to set up our tents. Ahh, ano nang gagawin namin ngayon?? This leisure time in Saulay campsite proves that an extra day to our itinerary is not a waste after all. Petik petiks at chill chill lang sa bundok, and it's priceless! that's us slacking at Saulay campsite. By lunchtime, we had beef with broccoli. 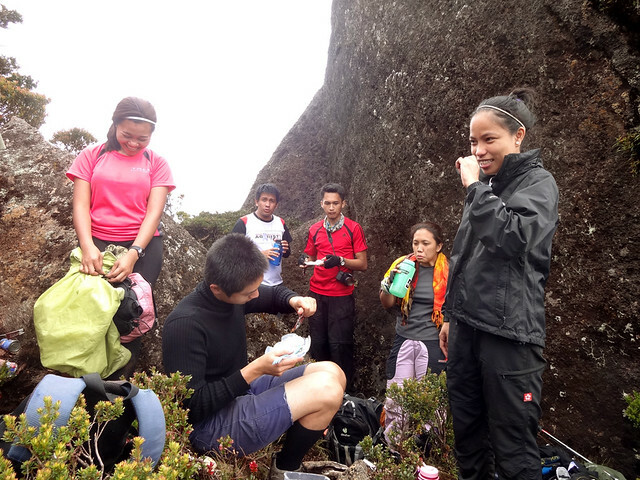 Maam Joy prepared this sumptuous meal that's usually cannot be imagined being eaten in the mountains. 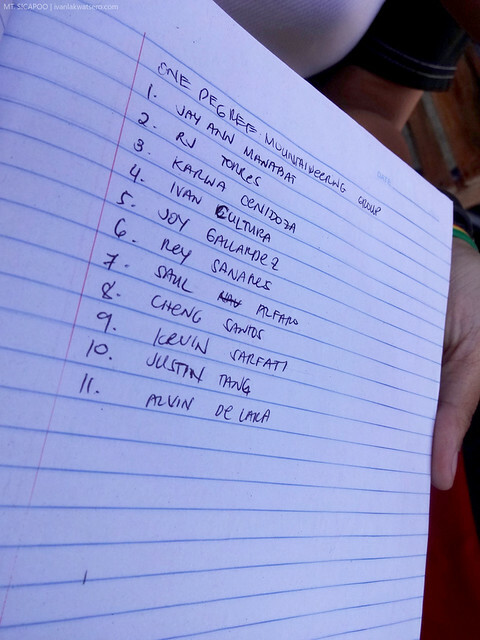 We divided our team into several groups para madistribute ang meal planning. At ngayon, naging pabonggahan na ng mga recipe. After lunch, all of us suddenly felt the need to go to sleep. Ewan ko ba, parang nilagyan ng sleeping pills yung kinain namin at isa-isa kaming nagbagsakan. So for the next 2 or 3 hours we were all just sleeping. It is probably the best siesta I ever had in my life. Waking up at around 3:30 PM, the whole team still have nothing to do. And boredom began to struck upon us all. So to kill time, we decided to roam around and take as much pictures as we can. Thank goodness, we're at the best place at the right time. Later that day, many of us suddenly felt the urge to poop, me included. This is my personal blog so I will share whatever I want to, hehe. Bigla na lang naghanap ng tissue paper ang bawat isang nakaramdam ng pagnanais. Imagine that, mine bombs carefully being planted in strategic positions all at the same time. I think, everyone of us have already mastered the art of pooping in the mountain, so things went smoothly. Lenticular clouds blanketing the summit of Mt. Sicapoo. Time flew so fast that afternoon. Before we notice it, it was already past 6 PM. The assigned team prepared carbonara for dinner, and it all went down to hungry tummies. 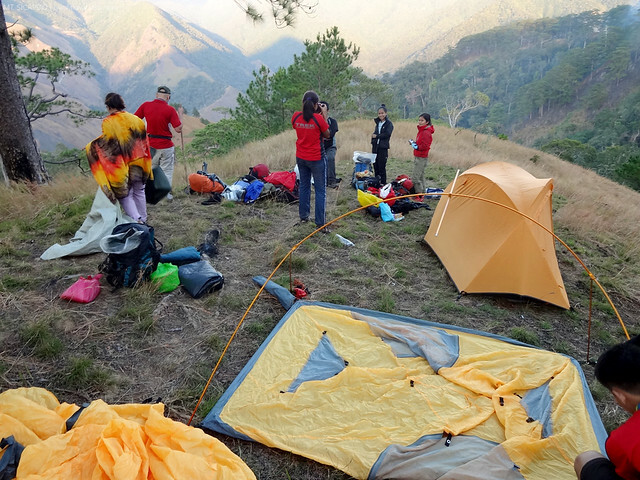 Moments later, we all retreated to the comfort of our tent as we are to leave for the summit tomorrow at 3AM. Sana lang maging maayos ang lahat bukas. End of Day 2. Mumbling sounds from the outside woke me up at 2 in the morning. I've only slept for about 6 hours kaya sobrang antok pa rin ako. When I tried to go outside the tent to join these early birds who seemed to be having a good time already, extremely petrifying cold winds pushed me back. So therefore, I joined again my 2 other tentmates who were still asleep that time. Anyway, I have already prepared my daypack before I sleep last night, so I'm all good to go. However, before I even close my eyes to sleep again, the assigned group called everyone up as breakfast is already waiting. It was around 2:30 AM when we had our very early breakfast. Masarap naman yung pagkain, chicken noodles with egg plus a cup of coffee. However, I can't seem to enjoy my meal as both my hands were were shivering vigorously because of the chilly air. So instead of enjoying my food, I tried my best to finish it as fast as I can. We were a bit on a rush since we wanted to start on time. 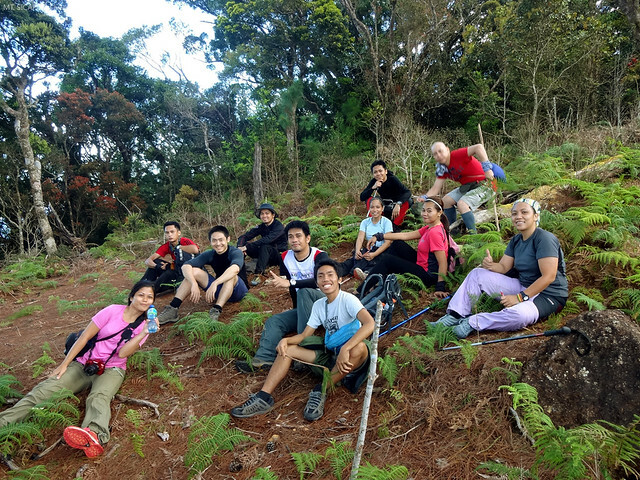 When everyone were on their trekking shoes (except for Tatay Emil and another guide who were staying to look over our campsite) and ready to go, the day's adventure began. Of course, we offered a prayer for everyone's safety and success before taking off. Everything was pitch dark from the time we left our campsite until the break of dawn. 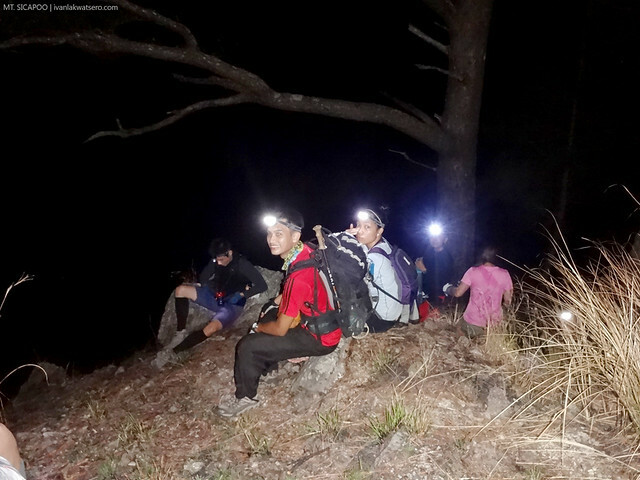 During the wee hours, we relied solely on pure instinct and of course, the spotlight provided by our reliable head lamps as we pass by the sharp steep ridge that connects Saulay and Bubuos Campsite and even beyond. 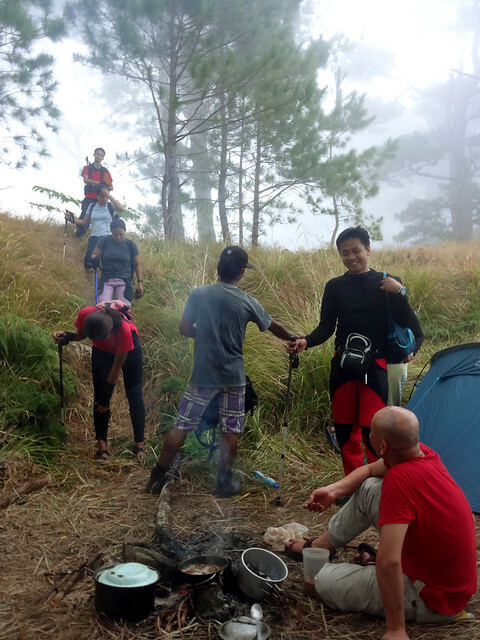 [Bubuos Campsite is another popular alternative place to set up camp, aside from Saulay Campsite. Hikers choose this mainly because of its proximity to the summit]. lakad sa dilim. From 3AM until dawn. It was around 5 o'clock when the sun began to shed light all over us. And it was only then that we were able to stop, breathe, look around and appreciate the beautiful things, small and big, surrounding us. 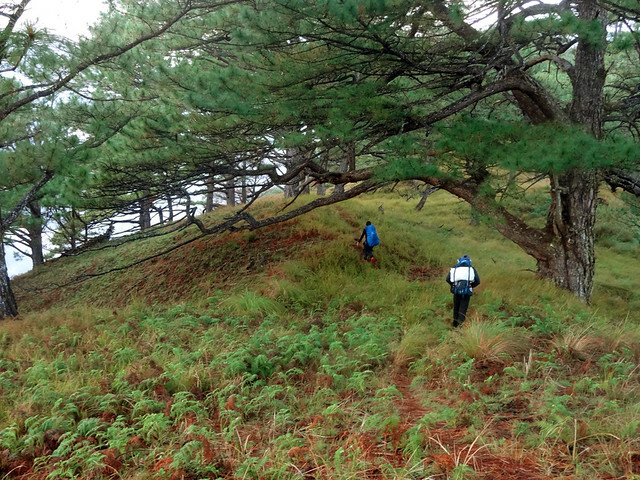 Towering pine trees, deep curving slopes, and endless ridges, they were all there to put us in awe. and all I can do about it, is be thankful to the Creator. 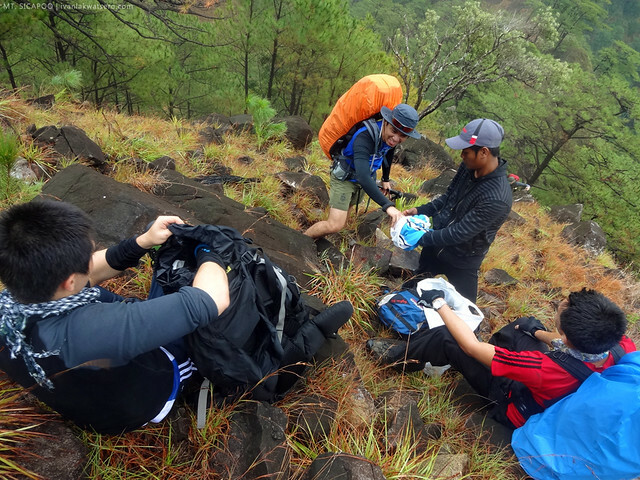 Despite the long, seemingly endless trail to the summit of the mountain, the whole team kept pushing forward. There was so much eagerness in each one of us that no one among us showed weakness. There were just laughter, excitement, positivity, and a bit of thirst and hunger. Yep, halos na-burn na namin yung very early breakfast at malapit na din maubos yung mga dala naming tubig. We must survive until the next watersource. 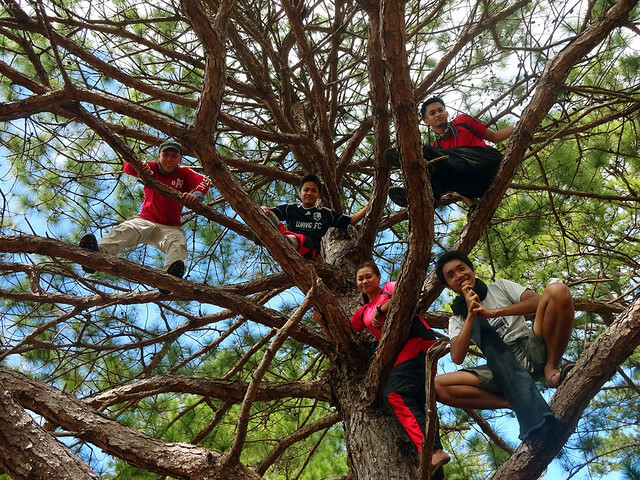 Here's us, taking a well-desrved break at a place not too far from Pakpako campsite. 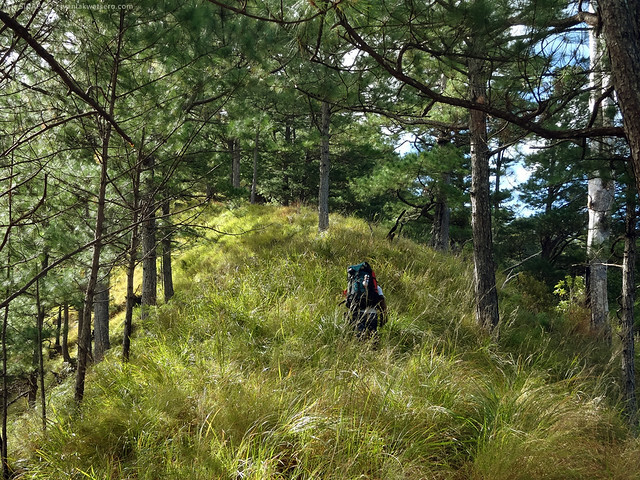 About 45 mins past Pakpako campsite (another alternative campsite aside from Saulay and Bubuos Campsites), we reached the trailhead to Matalidong ridge. 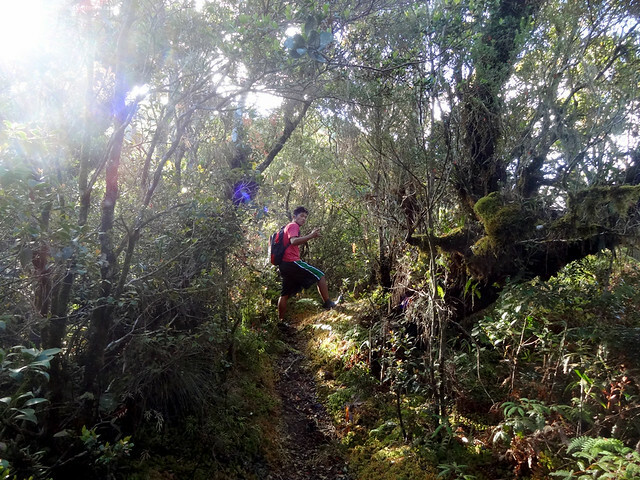 The environment keeps changing and changing from ferny paths, to a trail lined by giant, and then a combination of the two, until finally, a thick mossy forest. at some point we would ascend sharply. Hingal to da max! 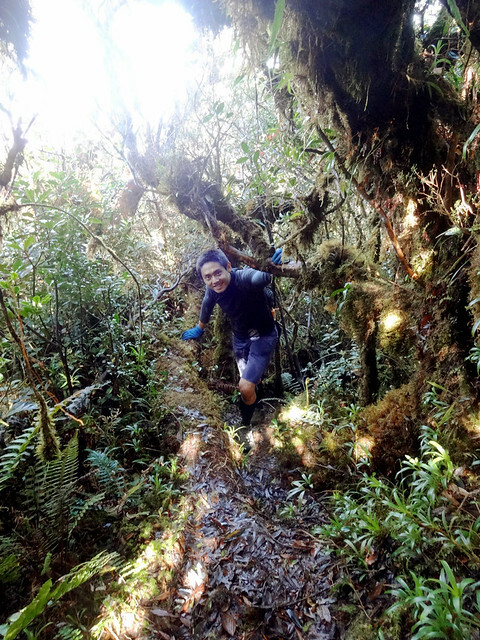 The mossy forest was expectedly wet and humid. We ran out of water upon reaching this portion of the trail. Kaya naman sila kuya guide, nagkumahog patungo sa nag-iisang water source sa lugar. Our guides know by their hearts every corner of that confusing maze of moss. So in no time, we found the life-saving source of fresh water. Moments later, we arrived on place where we can finally see the very summit we were aiming for. Lalo kaming nabuhayan ng loob. We knew it's just a few more tumblings away. From Matalidong viewpoint, there's the summit!!! 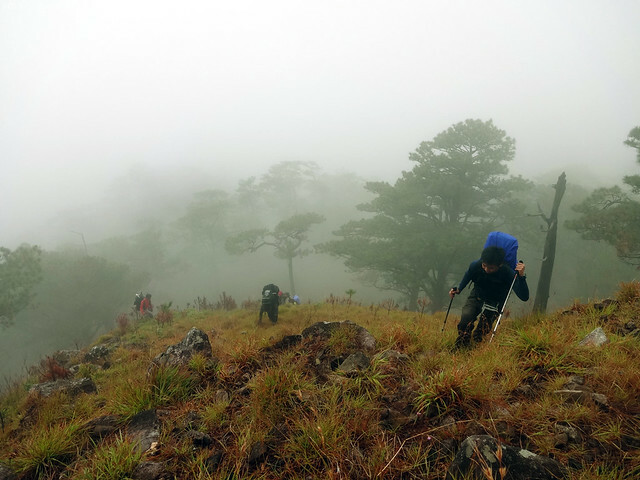 The last stretch of the trail from Matalidong view point up to the highest peak was harsh and a bit unwelcoming. There was no clear open path. The trail was narrow, obstructed and more importantly, very steep. It's like nature's way of telling us "dadaan muna kayo sa butas ng karayom bago magtagumpay." Finally at 10:30 AM, our goal was met. We successfully arrived at the summit we've been dreaming for these past 3 days. Ang maganda pa nito, we were so blessed with a pleasant weather. After all those pain, sweat, blood and tears (tears talga? ), we caught the penguin of Ilocos Norte. At hindi pa kami nakontento, some of us further srumbled up to the head of the penguin. I must tell you though, getting there was no easy task. Yo, what's up! I have tamed the wild penguin and now sitting on its forehead. Sinubukan kong tumayo pero hindi na kaya ng tuhod ko. Nakakalula. by the way, effort ang pag-akyat sa penguin. climb with extra caution. 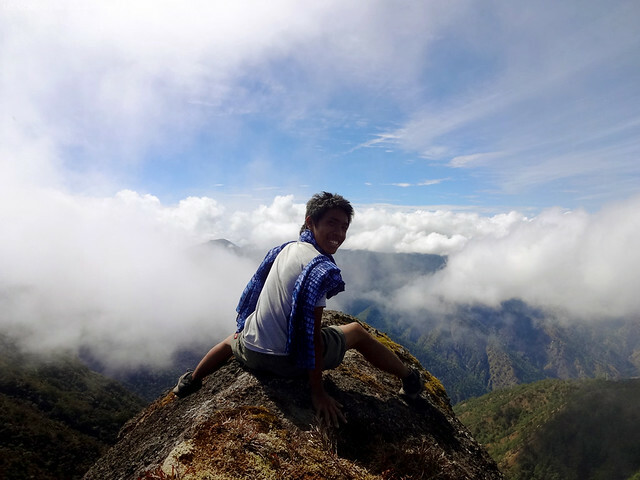 After all the trouble we've gone through just to reach the highest point in Ilocos Region, I think it's just right that we stay there for some time. Sulitin ang pambihirang pagkakataon, ika nga. So there, right at the foot of the penguin rock, we rested, had lunch, and laughed at our experiences so far. We stayed at the summit only until 12 noon. 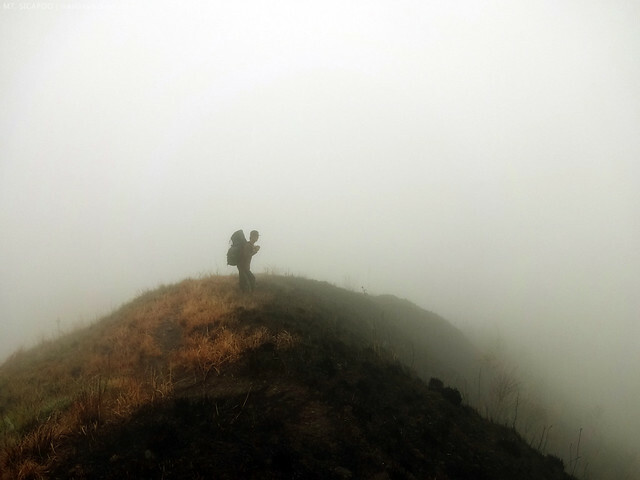 Around that time, clouds began to close in, covering much every thing at the summit. This in turn caused the temperature to drop, forcing us to descend as soon as possible. It took us a while to descend from the summit and return to our camp at Saulay junction using the same trail we threaded during the ascent. Familiar scenes were encountered but this time, it was misty. Also, the energetic spirit we had earlier seemed to have unfortunately abanoned us. I felt pain, tired, and hungry (again). As I remember it, we were trekking like zombies. But we must keep going in order to get the day's prize - a well-deserved rest inside the comfort of our tents. Marami pa ring paakyat kaming nadaanan. My thighs almost ruptured. 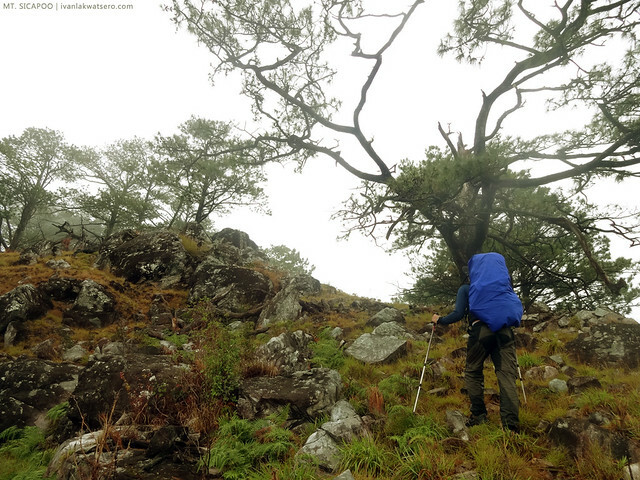 The last leg of the trek (the ridge that connects Bubuos and Saulay Campsite) proved to be very challenging. 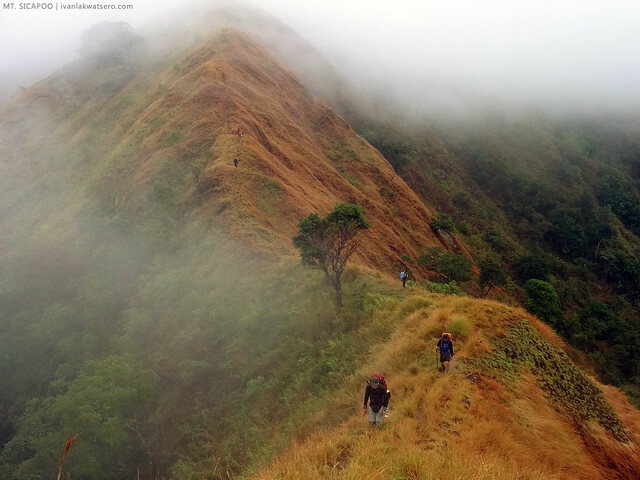 When we trekked along this steep ridge early in the morning, it was still too dark. That time, parang wala lang, dumaan lang kami. But now, with the light of the day, I saw with my own eyes how perilous it was pala! a little carelessness and you might end up lasog-lasog down below. By 3:25 in the afternoon, I arrived first at our campsite, tired but in one piece. I removed my shoes first then sat on the ground cushioned by fallen pine needles. Ahh, isa sa mga pinakamasarap na pakiramdam talaga ay ang matapos mo nang maaga ang isang napakahabang trek. And then I put on my slippers, changed my wet smelly clothes with a dry one, then I sat beside Tatay Emil to tell stories of today's adventure. nakahinga rin sa wakas ang mga paa. soon after, the whole team is complete again. Everyone made it back to campsite in one piece and with enough energy to prepare for dinner. I think we had beef, or probably pasta that night, hindi ako sigurado. But one thing is sure, whatever we had that night for dinner, it managed to hit the spot. The dinner was then followed by a fun socials. Hindi raw kasi kumpleto ang araw na walang ganun. Tatay Emil evenually became the star of the night. 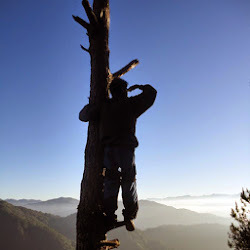 Nagkuwento ng kung anu-ano, ang naaalala ko na lang si Apong Lakay na kapag nag-ingay o nagbiro daw tungkol sa kanya, bigla ka na lang mawawala sa bundok. Siya raw ang espiritong bantay sa mga kabundukan sa Ilocos. His stories made the vibe that night light and fun. By 10 PM, when the chilly air has gone quite unbearable, we finally called it a day. Although it's fun and exciting to be spending precious days in the mountains, certainly, there will be a point in time where you'll miss your normal life in the city. I somehow felt that on our 4th and last day in Mt. Sicapoo. Bigla kong naalala ang mga mahal sa buhay na nasa syudad, yung mga responsibilidad na naiwan sa trabaho, lalong-lalo na ang kumportableng kama na hinihigaan. 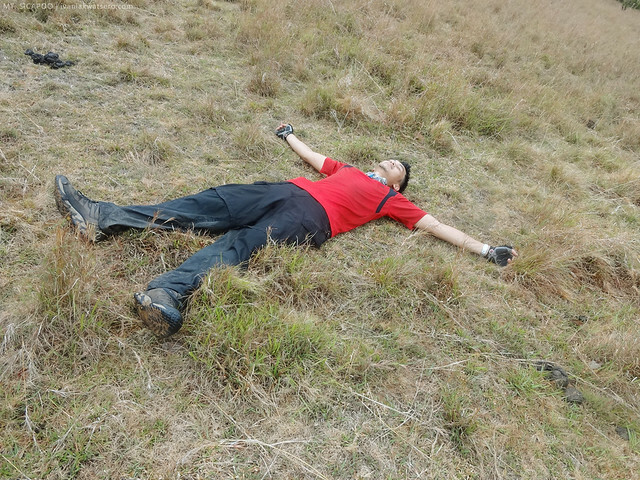 Anyway, having this in mind, I became so motivated to finish the so called rosary trail of Mt Sicapoo. We left Saulay at 6:45 AM, after filling up our tumies with loads of carbs. We all know it's gonna be a long way ahead of us. Several challenges were met as go in full swing. 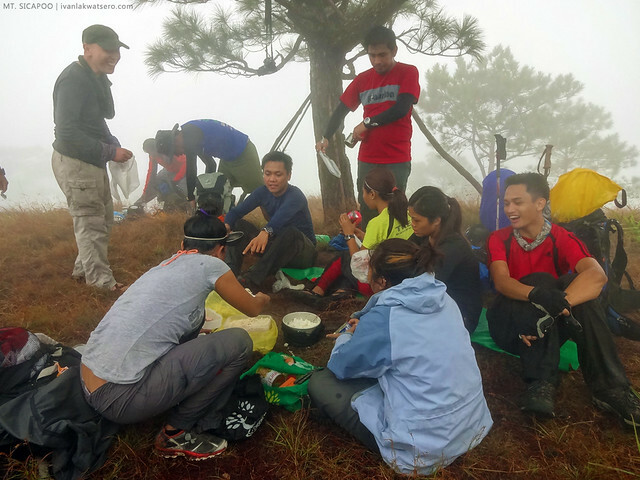 From engaging ourselves to trekking up and down the steep narrow ridge trails leading to Timarid summit, to wet and cold environment brought about by the drizzly weather that has been going on since the start of the day. malayo pa ang tatahakin naming daan. Start of trek, 6:45 AM. I was struggling, but at the same time, marveled by the scenery that's keep coming from all corners. Kahit saan lumingon, napapanganga ako sa ganda. 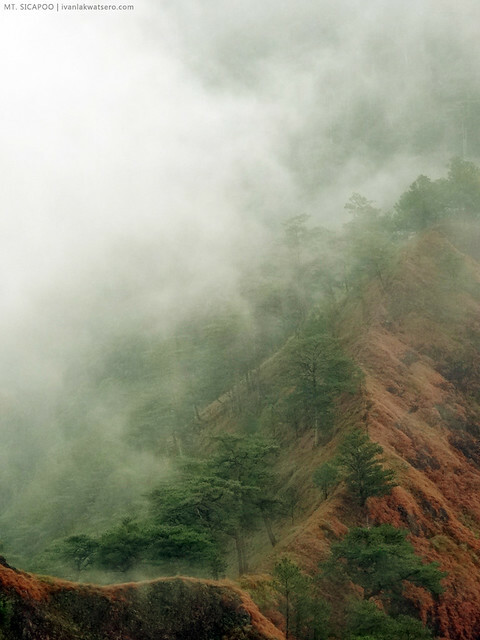 Although most of the time, the mountain was covered in thick white fog, there were still many instances that it cleared up and revealed the Creator's works of art. It's really hard to put in words how beautiful those sceneries I've seen with my own eyes. 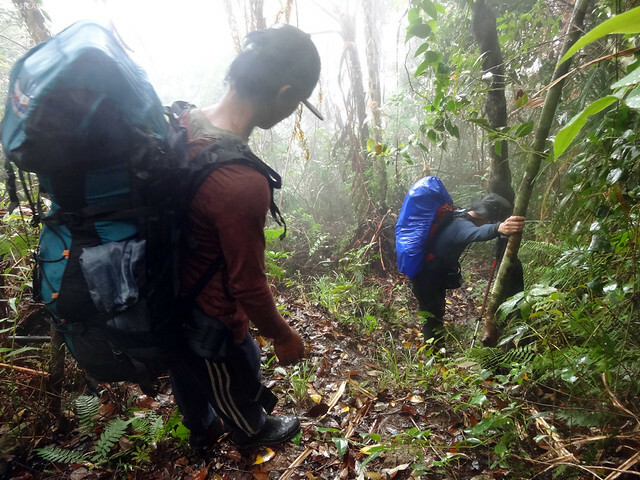 While scrambling our way up to Timarid summit, one from our team met an accident. His right hand middle finger was hit by a rolling loose rock, and as a result, it bleed. Pero dahil malayo naman daw sa bituka, sabak pa rin si sir Saul sa giyera. atapang atao! We have nurses sa team kaya no worries. The hike to the summit of Mt. Timarid was long and arduous. Again, it's like Akiki to the 10th power. We're lucky to have been blessed with a very cloudy weather that day, for if it was a sunny day, deym, we'll be walking in a furnace. strive hard and you shall succeed. Konti pang tiis. At 9:30 in the morning, we finally arrived at the top of Timarid. 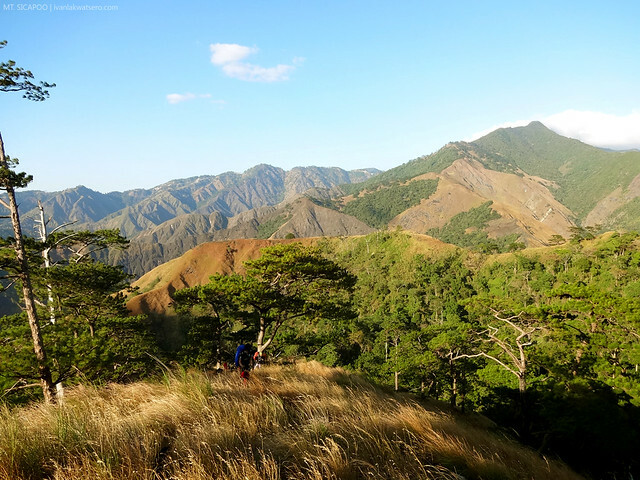 It's an open grassland (but burnt) that, if it wasn't cloudy, would offer a range of jaw-dropping views, from lowland plains of Ilocos Norte to the majestic mountains of the great Cordilleras. It would've been a 360 view kung hindi lang maulap. Nakapanghihinayang na hindi namin nasulyapan ang mga ito. Well, the bright side to reaching the summit of Mt. Timarid is that the trail beyond that point would be entirely descending. Meaning, tapos na ang paghihirap namin sa mga nakakahingal na paahon. Mt. Timarid, the charred mountain top. 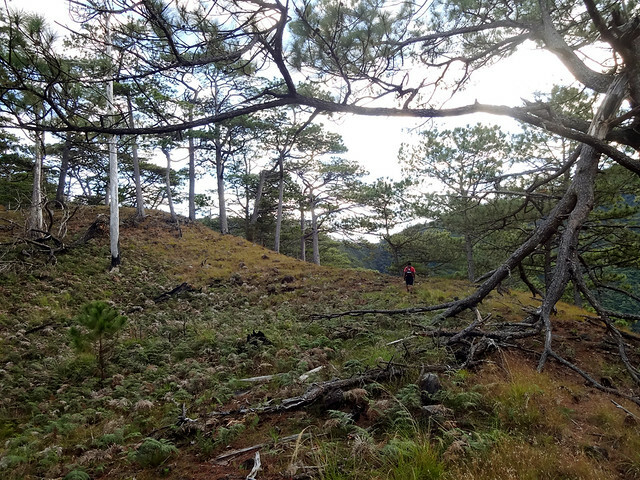 Past the summit of Timarid, we again passed by lengthy narrow ridge trails and charred woodlands. It was also around this time that the fog grew thicker, and thus limiting our vision to just a few meters. Nagmukha tuloy creepy na tila Silent Hill yung tinatahak namin. too creepy, parang biglang may lilitaw na zombie. A portion of the trail also runs through an overgrown forest, with thorny bushes and sharp blades. Naturally, it incurred scratches and cuts throughout my face and forearm. Kung alam ko lang na may ganun part pa pala, nagsuot sana ako ng long sleeves. 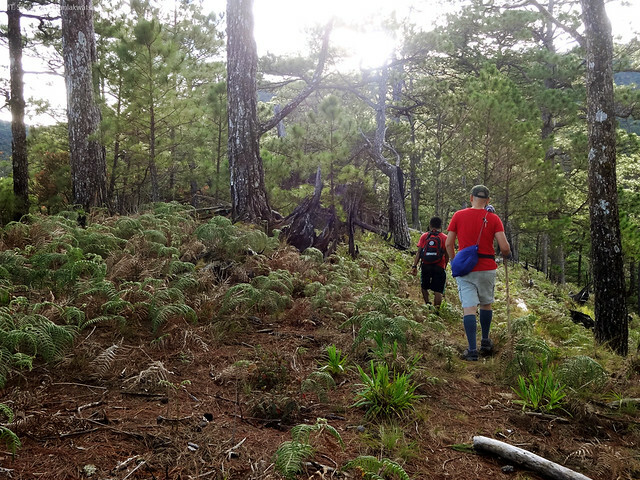 past the thick forest, came another ridge trail. Down we go. After hours of walking, we stopped on an open grassy area for lunch. We had soup, carbonara (again), and meat loaf. 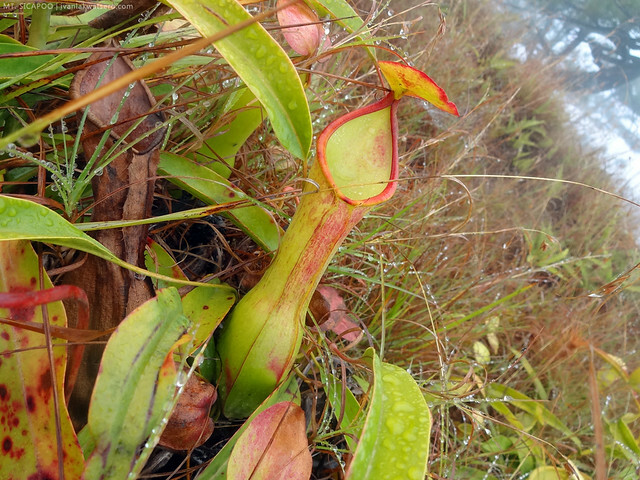 We resumed our descent at 11:15 AM, passing by a slippery slope with blooming Nepenthes species (pitcher plants). After that, we again trekked inside another dense forest. The trail was steep, narrow and slippery, but manageable nonetheless. 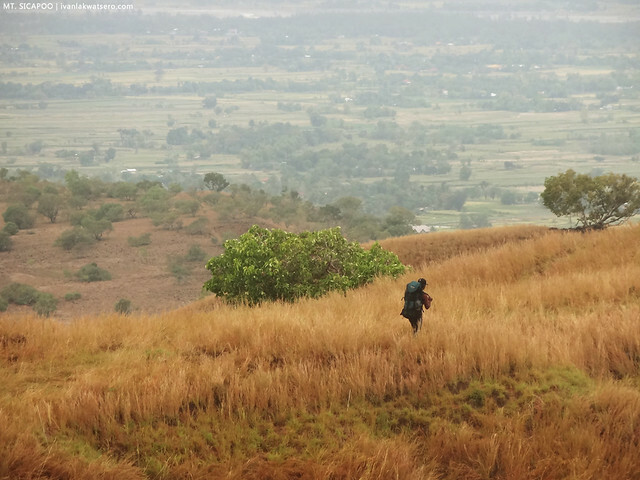 It was almost 12 noon when we finally came out to a grassy rolling hills. Meron ding pitcher plant sa Ilocos. steep downward trail. Good thing there are branches to cling on. Thick fog pa rin. Many parts of the mountain were burnt. 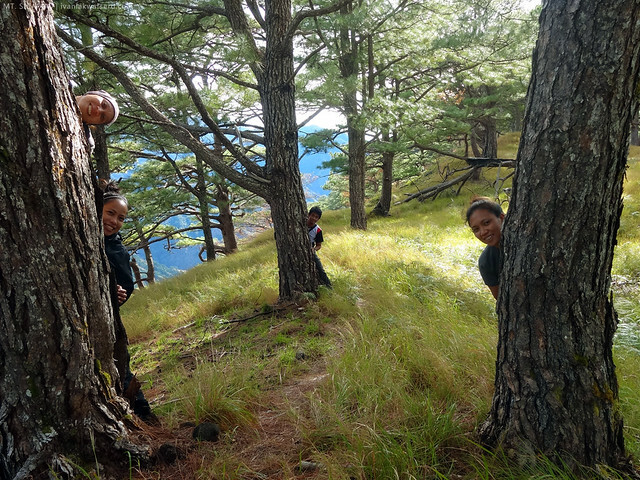 As we were threading our way down the half-grassy, half-charred mountain, we noticed something moving on the ground. 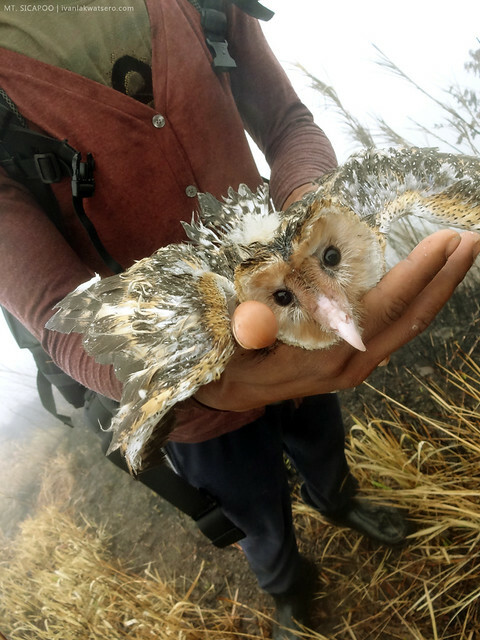 A pitiful, helpless and weak young bird, struggling for its life. Its home was obviously destroyed by the persistent grassfire in the area. Inasmuch as we wanted to rescue the helpless bird, we weren't able to. When we grasped its legs, so we can bring him to somewhere safer, leaped away from us. Ipinagdasal ko na lang na mag-survive siya sa malupit na mundong ito. The thick white fog keeps coming and going as we go further down the rolling grassy hills. For sure merong 360 view kung nag-give way lang yung clouds, kaya lang wala talega eh. The entire time, we were only seeing glimpses of that supposedly 360 degrees view. Anyway, we continued pushing forward. The descent was long but not really tiring. That's the good side of having a cloudy weather. Along the way, we met a herd of cow, which by the way owned by Tatay Emil. Then at around 1:30 in the afternoon, the clouds that kept everything obscured from the start of the day finally subsided. Consequently, the much awaited panoramic view has revealed itself. 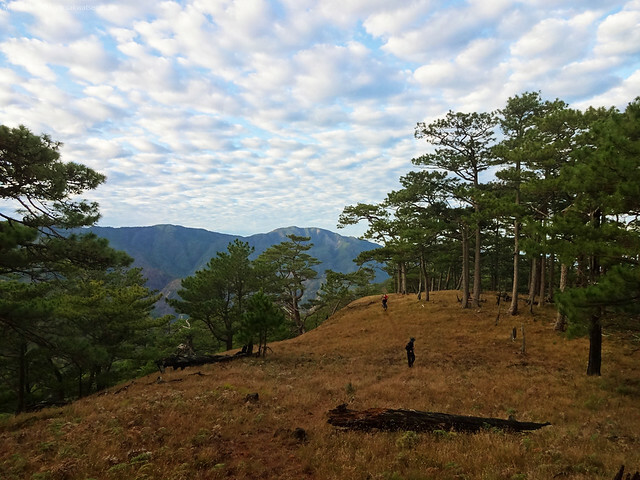 Pulag-like scene in Mt. Sicapoo. at this point, One Degree Plateau came to sight. 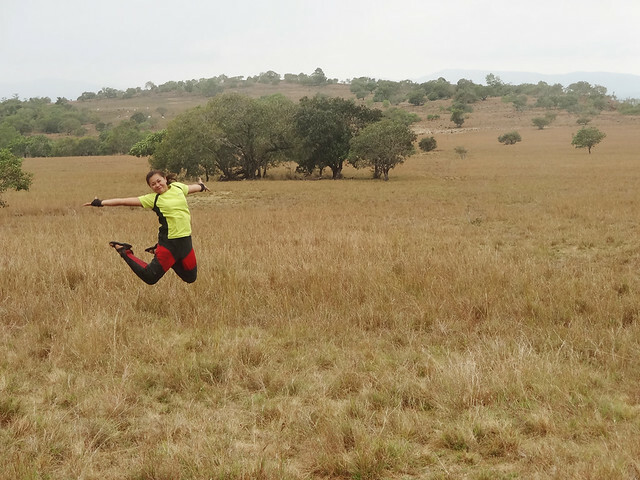 You'll know you're nearing the end of this adventure once you set foot on the wide savanna that is One Degree Plateau (ODP). It gave us relief, excitement, and a trace feeling of success. Konting kembot na lang, tapos na aming pag-hihirap. One degree plateau, at last we meet. We received a warm welcome from ODP as we arrived in the place. Napahiga, napatalon, at na-amaze din kami sa lugar. There were cow dungs everywhere but who cares, gusto namin humiga at walang makakapigil samin. 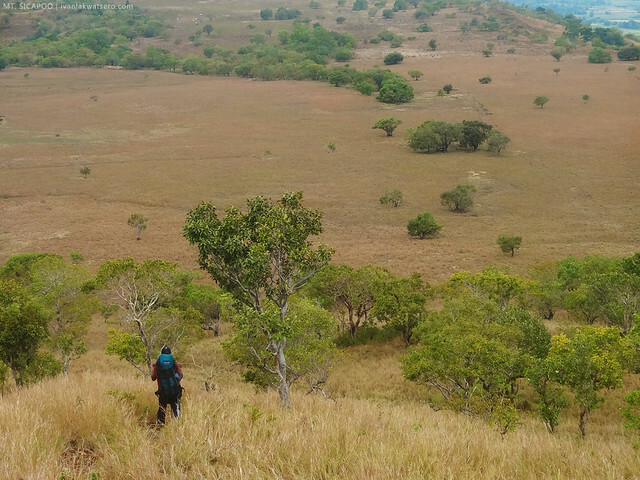 I think I haven't seen any place like this before - a savanna. Sabi ko nga sa loob ko, parang kulang na lang ay mga zebra at giraffe at para na talagang African savanna. Plateau or talampas. A flat elevated land form. Since the final stretch of the trail is possible to finish within 30 or 40 minutes, we opted not to rush things. For the next 15 minutes, we just relaxed, lied down, and took many good pictures of the place. It was only 2 o'clock PM, maaga pa, chill chill lang muna. being a grazing field for cows, there were numerous ebak everywhere. Pero hindi yun sapat na rason para pigilan si sir Kevin na maglupasay. At exactly 2:15 PM, we decided to cut short our procrastination and continue our pursuit for the finish line. Well, it did not take really long, for after about 20 minutes, we can already see the end point of our adventure. By quarter to 3 in the afternoon, the 4-day Mt. Sicapoo adventure has finally come to an end. I had so much fun and seen so many hidden wonders. Instantly one of my favorite hikes in 2014. Hoorah! While waiting for our jeepney service, everyone took the opportunity to wash up. And the irrigation system just at the back of Tatay Emil's house is just what we're looking for. Malinis naman at galing sa Mt. Sicapoo ang tubig na yun kaya it's really refreshing. By 6 PM, we bid good bye to the friendly people of Brgy. Manalpac. Agyaman ak kadakayo amin! Later that evening, the group had a celebratory dinner somewhere in Laoag City (salamat sa aming sponsor na si Sir Alvin at sir RJ). After that, we parted our ways. 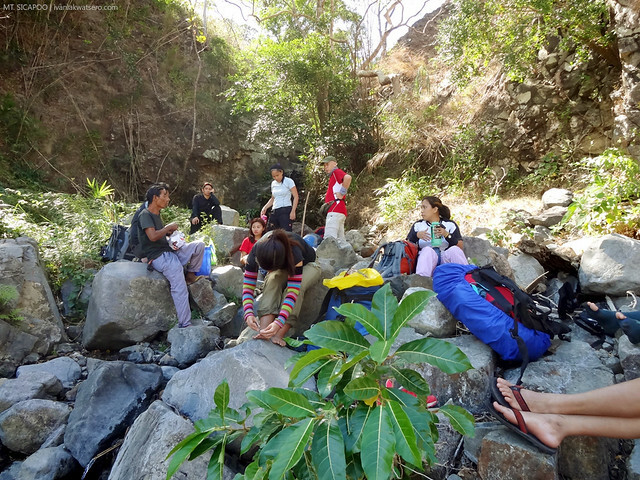 Some of us took the next available ride back to Manila, while others opted to stay and tour around Ilocos. Dahil nga masyado pang sariwa sa alaala ko ang mga pinuntahan namin noong nakaraang linggo lang, I decided to head back to Manila. 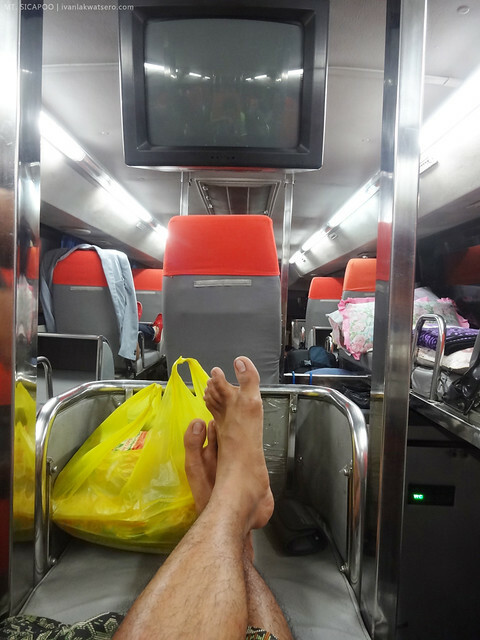 PS: I would just like to share that we boarded a sleeper bus back to Manila. It was my first time to be inside such thing and I enjoyed it big time. Sarap ng tulog ko, sulit na sulit! Sana maulit muli. hehe. I'd like to send my many thanks to our Team Leader who made this hike a reality. Salamat Madam Jay, sana mabasa mo ito. And of course, big thanks too to everyone who took part in this memorable epic journey: Sir Rey, Sir Saul, Sir Kevin, Madam Carina, Sir RJ, Madam Joy, Madam Cheng, Sir Alvin, and Sir Justin. 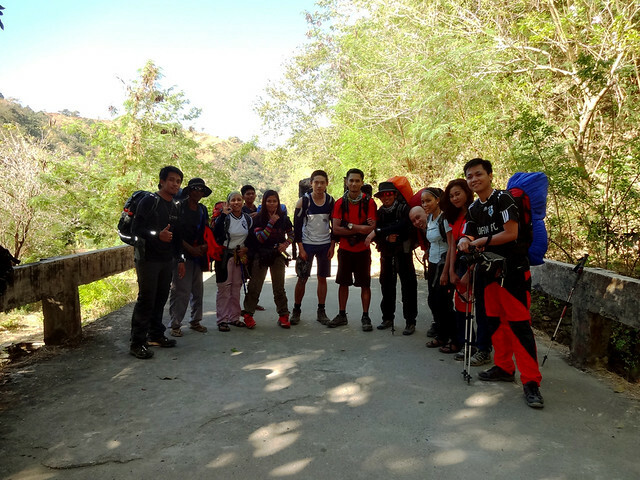 And of course to our 4 strong porter/guides, specially Tatay Emil, mabuhay po kayo. Bigla kong nagdalawang isip sa pagsama this dec.26-30 hahaha... grabeh katakot yung "AKIKI to the 10th power". Congratz sir! sana magawa ko din yan.. makaya kaya ng tuhod kong galing lng sa injury??? abangan sa mga susunod n kabanata.. hahaha WISH ME LUCK!!! enge po tips mga IDOL!!! Has anyone ever reached the summit of Mt. Sicapoo? Could he post a picture? Thanks. May I know what bus liner is that? Reminds me of the Knight Bus from Harry Potter, where instead of seats, there are beds to sleep on during the ride.... nice! Magnifico mga dre. 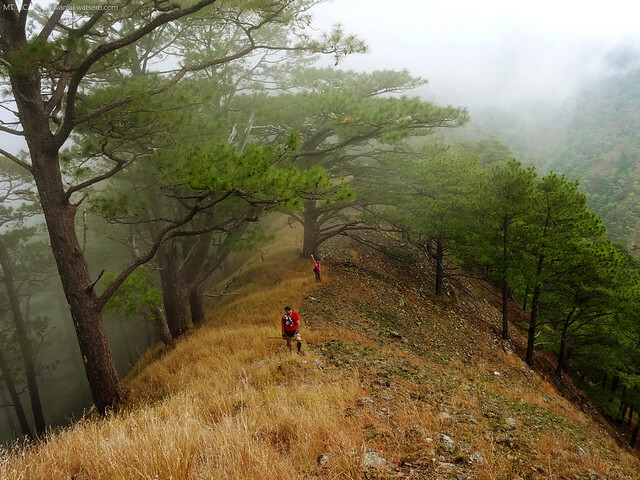 :D Ask ko po kung saan kaya parte ng ilocos nag meet mga hikers? specifically from batac ilocos ako manggagaling. 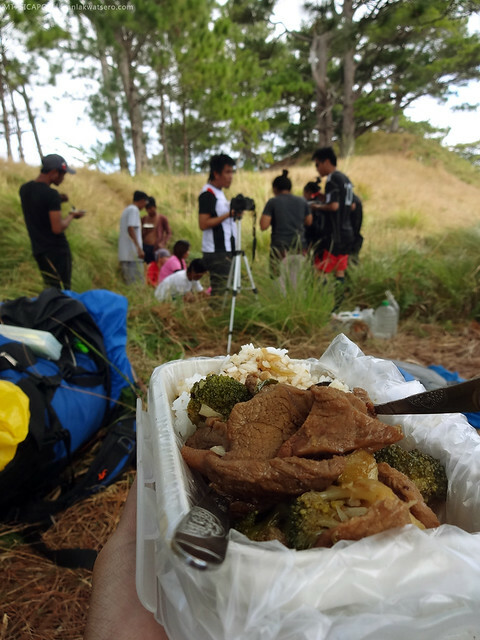 ty po hikers.